We Made It To Mont Tremblant! After 13 hours of bus ride, our group finally arrived at Mont Tremblant for some fun on the slopes amidst major snow storm. This was my first snowboarding outing of the season and I could sorely feel my lack of exercise in the past 6 weeks. By the time we made it to the summit, it was already close to the end of the day so of course the trails were full of mogols. I found that it took a lot of effort to negotiate my way around the mogols and so by the time that I was half way down the mountain, my thighs were burning from the sudden burst of exercising that I put them through. Although I only managed to squeeze in two runs before the lift shut down, I was a little exhausted. Dinner was a simple affair of fajitas and tacos. Between our two condos, we had plenty of kitchen space to cook everything at the same time. One of my pet peeves for these equiped condos is that they never have good knives in the kitchen. Normally, I would pack my chef knife in my knife roll when I go to ski trips but this time I just didn't bother. That was how I found myself cutting vegetable after vegetable with a small steak knife. Well, at least it was sharp. I took care of pan-frying the chicken while JV and SH cooked the ground beef in the other condo. JW and KA made guacamole. With so many pair of hands, dinner was ready in no time. It was a satisfying meal after a long day of traveling and too little time on the slopes. After dinner, we felt a little lazy so we were just relaxing in the condo. JV and I made a batch of vin chaud that was quite delicious. Vin chaud is warm wine infused with spices that is popular around Christmas time and is just the perfect drink after a long day of skiing/snowboarding. The election debate was on television. With plenty of wine and beer at our disposal, it didn't take long before we started a drinking game. We drank to "Canada", "election", "immigrants", "promises", "Bush", "care", "China", "Iraq", and even spelling mistakes on the close captioning. It was one of the most entertaining debate I've ever seen. Who knew debates could be so much fun?! We ended the night with more drinking and some dancing at Cafe d'Epoque. This turned out to be quite a different experience than my previous trips to Mont Tremblant. 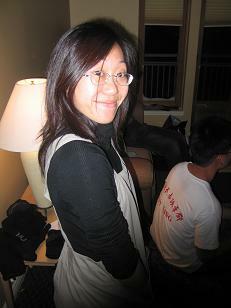 Three years ago, it was potluck dinner with AL's friends from university in a chalet outside the resort. Two years ago, I enjoyed a quiet fondue and wine night with friends from university. Last year, it was a fun hot-pot dinner with my Chinese friends. At the end of the day, good company is what really makes the experience memorable. Out of nowhere, I have a sudden craving for marshmallows today. Do you know that marshmallows are totally fat-free (though loaded with sugar)? I love s'mores as much as anyone but I'm not so keen on the tree branch. Usually, I would take my trusty kitchen torch and "brulee" the marshmallows instead. Being the procrastinator that I am, of course I have to google marshmallow. What do you know, I now have a new toy high on my wish list: Marshmallow Shooter. It looks to be an absolutely awesome toy to have around the office!